A pair, originally uploaded by gilfling. I meant to blog about this last week but got so busy that it completely slipped my mind! 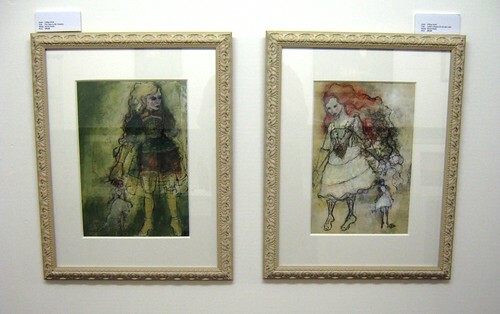 These are two of three peices that are now exhibited in the Focus Gallery, Nottingham. All 3 were actually completed quite a wee while ago but were being saved to be part of this exhibition and I am delighted that the third piece (which you can see unframed - here) sold at the preview. I actually couldn't be there as it was the day I attended the training course in London but I was absolutely delighted to have sold a piece! It is also a thrill to see my work professionally framed. With the constant barrage of information on the economy I am so reassured by the fact that I have sold 2 originals in 2 weeks - (not being a particularly prolific painter as discussed in my last post and having recently raised the prices of my originals, this is a really big deal for me) - so I do have hope that art will still sell! Also thank you so much for your wonderful comments and support in my last post - as is often the case in this blogging world - we share so many experiences and thoughts! Found your blog after buying your prints. I really do think your work is lovely.